Why pay rent when a beautiful home is within your reach? Is your object to enrich your landlord or to provide a cosy corner for yourself and family? Please remember that we are offering lots for almost nothing as compared to City lots, and on terms which will enable you to pay for them with your pin money. We will contract to build you a home according to your own plans, and let you pay for it just as you would have to pay rent, with only 6 per cent interest on the actual cost. You may make your own contract, draw your own checks, keep your own books and finally accept or reject the house, just as if you had paid every dollar out of your own pocket. This is the most model residence plat in the State. It is 200 feet higher than the City, is approached by an elegant Avenue 100 feet wide, now being graveled. Has NOW in actual operation, a double track street car service, City water mains, graded streets, cement sidewalks. Two rows of young shade trees on every avenue and a graded City school within five minutes walk. If you think all this is too good to be true, ring us up at our City office and our salesman will call and take you through the property, and submit these propositions personally. There is no property in the State which, for safety and the certain of an increase in value, offers greater inducement to the home-seeker or investor than our lots. This is an opportunity, within the reach of all, which should not be cast aside. Sounded too good to be true in 1906? It may have, but folks were very enticed. Those who were bitten by the house-buying-in-the-suburbs bug could contact the Capitol Heights Development Company at phone number 666 at their downtown office in the Pollak Building or stop by their offices at the corner of Madison Avenue and Vickers Street to be shown the lots available. This advertisement, appearing in the Montgomery Advertiser on Tuesday morning, February 13, 1906, must have sounded like paradise—cool breezes, peace and quiet, and reliable public transportation, yet still minutes from Downtown. And the Capitol Heights founding fathers and mothers scurried to take advantage of this unbelievable offer, quickly building homes in a variety of architectural styles and sizes along both Madison Avenue and South Capitol Parkway. After World War I, many more homes were built north and south of Madison Avenue and the city of Capitol Heights expanded all the way to Federal Drive. 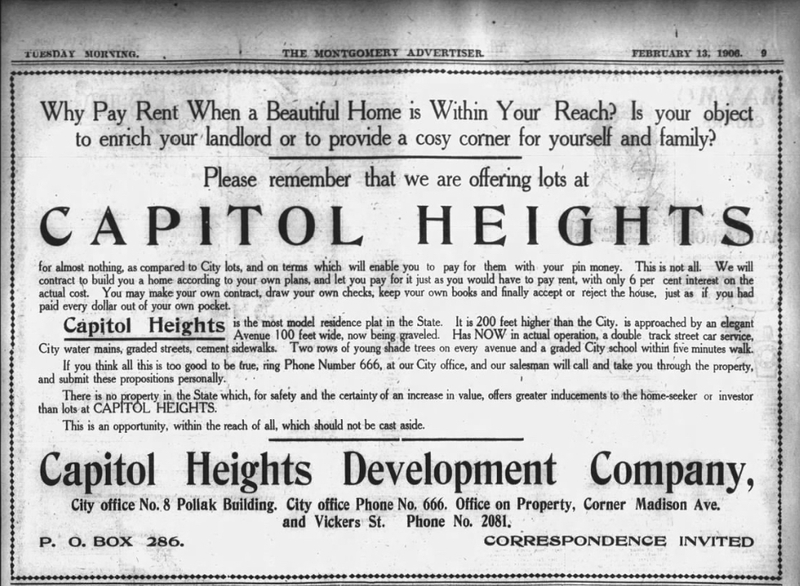 Today, 112 years later, Capitol Heights folks are still enjoying these advantages of “modern” urban living outlined in this timeless real estate advertisement! What wonderful information! And to add to the wonder, Old Cloverdale (just Cloverdale then) was coming on line at the same time. Have often wondered why one ended up being much more expensive than the other!